Finow X5 Air 3G Smart Watch 3G Watch Phone, 1.4" Super AMOLED Display, Quad Core Processor, 2GB..
English Version Huami Amazfit Bip Smart Watch GPS Gloness Smartwatch Smart-watch Watchs 45 Day.. 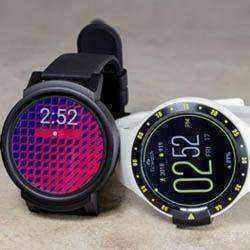 Feature* OS: Android 7.1, CPU: MT6739* Frequency Band: 4G LTE-FDD B1/2/3/5/7/1..
Xiaomi Mijia Smart Watch IP67 Waterproof Smartwatch Bluetooth 4.0 3ATM Quartz Pedometer Wristband Fo..
English Version Huami Amazfit Stratos Smart Sports Watch 2 GPS 5ATM Water 1.34'' 2.5D Screen GPS Fir..
Network Frequency:2G GSM:B2/B3/B5/B83G WCDMA: B1/B2/B5/B8TDS-CDMA: B34/B494G FDD:&nbs..
Finow Q1 Pro MTK6737 Quad Core Android 6.0 4G smart watch 1GB/8GB SmartWatch Phone Heart Rate Sim Ca..
2019 New Finow Q7 smart watch Phone support Android 5.1 MTK6572 3G Wifi bluetooth with 0.3MP Camera ..
MAIN FEATURES:* OS: Android 7.0, CPU: MT6737M* Frequency Band: 4G LTE-FDD B1/3/.. Features:1.System Requirements:android4.4 and above, iOS 8.0 or above, support for Bluetooth 4.02.Bl.. Highlights:* 1.3 inch resolution 240 * 240 screen* Hardware platform: NORDI..